Any dirt, soil or other contaminates must be removed from the surface of the roof prior to installation of the Fibrecoat system. After the initial clean, the surface should now be power washed and rinsed to remove all residual dirt and contaminates after which the surface should be dried. Surfaces that have been the subject of moss and lichen must now be treated with a proprietary fungicidal wash and allowed to dry in accordance with the manufacturers instructions. 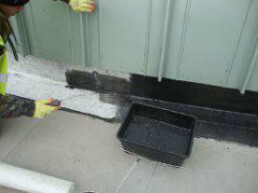 Adhesion of the existing coating system must be checked and all defective coating be removed back to a firm edge. Any ballast chippings present must be removed with a mechanical flail. Deeply embedded chippings need not be removed if removal would result in extensively damaging the asphalt. Any badly degraded asphalt must also be removed. Any badly degraded asphalt must also be removed. Asphalt blisters are to be cut open, exposing the surface which should then be dried, then rebuilt with a cementitious mortar. Failure to remove all loose Chipping’s will invalidate any Basecare guarantee. Roofing felt is to be inspected and any weak or degraded felt needs to be replaced. Blisters in the roofing felt are to be star cut, and the exposed surface to be dried and the felt re-bonded to the substrate. Fibrecoat can extend up and over brick/concrete parapet walls if required. Any cracks in these surfaces are to be cleaned out and filled with cementitious mortar in accordance with the manufacturers recommendations and allowed to dry prior to coating with Fibrecoat base primer in accordance with the application data sheet. Corroded metal surfaces are to be thoroughly wire brushed to remove corrosion and then primed with the Fibrecoat primer in accordance with the product data. All wood or wood based materials are to be primed with the Fibrecoat primer in accordance with the product data. Cut the Fibreglass Reinforcement to the required length and width for the proposed detail about to be completed. Take into account the wind when cutting the fibreglass so as not to leave unmanageable sections of fibreglass. Use a loaded roller to ensure full saturation of the reinforcement. Coverage rates are governed by the substrate. Refer to the specification and/or Allbase technical department for more details. Overlaps between strips of Fibreglass must be at least 50mm with feathered edges. Ensure there is sufficient material to saturate these overlap areas. Keeping the container warm at room temperature will assist with the application and coverage rates of the embedment coat. Cold containers will make the product thicker and more difficult to apply and therefore a reduction in coverage rate will occur. Insufficient coverage of the Fibrecoat material may make it difficult to embed the fibreglass. Flooding of the area may cause the Fibreglass to tent. Monitor application and check for wicked fibres or pin holing and apply more product where required. Allow to cure in accordance with Allbase Technical Services recommendations prior to application of the top coat. Once the membrane has cured, check for pinholes and any surface defects. Wicked fibres should be trimmed back and lightly abraded to provide an even surface prior to application of the top coat. Apply Fibrecoat to the detail area ensuring works are progressed to the point of egress. Immediately lay the Fibreglass Matting into the wet coating and begin to embed with a suitable roller. Once the detail areas are complete, begin installation on to the main roof area. Ensure overlaps onto the existing reinforced Fibrecoat sections are by at least 50mm. Apply a layer of Fibrecoat and embed into this the Fibreglass Reinforcement. Apply additional material where required. After application of the base coat, ensure full coverage and encapsulation of the reinforcement in accordance with Allbase Technical Services and the specification for that project. Any defective or loose areas should be cut out and replaced with new material to ensure the coating is fully bonded to a sound substrate. Prepare the specified Fibrecoat (second layer) and apply to the detail areas first before the main area. Ensure up-stands are a minimum of 150mm above the finished roof level. Apply the top coat at the coverage rate specified by Allbase; run a spike roller slowly over the freshly laid Fibrecoat to burst any bubbles and release any trapped gas before the Fibrecoat skins over. Use volume to area calculations to work out the coverage per drum prior to application. This will ensure the correct coverage rate is achieved. Wet thickness readings will also achieve the same result but is limited to the area chosen to test. Check all details and main roof areas for snags and treat accordingly. Any pinholes should be treated with extra product leaving a smooth homogenous finish. Allow to cure in accordance with Allbase Technical Services recommendations. Designated walkways should be marked out and installed only after the top coat has cured. Ensure the membrane has reached full cure before reinstating any proprietary components or plant work upon the roof. All liquid details must be suitably terminated with suitable materials such as termination bars, flashings, trims etc. Refer to the specification or Allbase Technical Services for details.